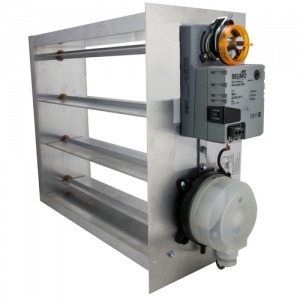 EB Series electronic bypass dampers are used to automatically bypass excess air when increases in duct static pressure occur due to closing of zone dampers. The EB series dampers utilize a floating-type motorized actuator along with the iO-SPC-800 static pressure control. The iO-SPC-800 has a fully calibrated setpoint dial for easy set-up and adjustment. The iO-SPC-800 maintains the system static pressure by modulating the bypass damper. EB series electronic bypass dampers are recommended for systems from 0.08" WC up to 1.20" WC of static pressure.